Craftster Community > COOKING > Dessert (Moderator: lindyv321) > Delicate chocolate butterfly cupcakes! 1. Whip up a simple chocolate cupcake batter: mix 1 1/2 c flour, 1 c sugar, 1 tsp baking soda, 1 tsp salt, 1/3 c cocoa powder, 1/2 c vegetable oil, 1 c water, 1 tsp vinegar, and 1 TB dry instant chocolate pudding. 2. Pour into cute cupcake molds, bake at 350 until a toothpick comes out mostly clean. 3. While the cupcakes are baking, grab a ziploc bag, fill 1/3 full with your favorite melting chocolate (I used Wilton's baking chips. Regular chocolate chips also work. Choose your poison.) and microwave on medium for 1-2 minutes, stopping every 30 seconds to knead the bag. Don't overheat the chocolate! Snip a tiny corner off the edge of the bag. 4. Fold a piece of wax paper down the middle and tape over a butterfly or dragonfly picture, with the wax paper fold sitting directly on top of the butterfly/dragonfly body. You can find good outlines at http://www.free-printable-coloring-pages.net/butterfly-coloring-pages.html. Gently trace the butterfly or dragonfly with your chocolate bag, starting by tracing the body so that it sits directly on the folded wax paper line. 5. Quickly pop your wet butterfly/dragonfly in the fridge onto a folded piece of cardstock. The folded line in the wax paper should sit directly in the center of the folded cardstock so the butterfly/dragonfly wings are pointed upwards in a "V" shape. 6. While the butterflies/dragonflies are cooling, frost your cupcakes. Gently peel butterfly/dragonfly from wax paper and set on cupcake. Voila! 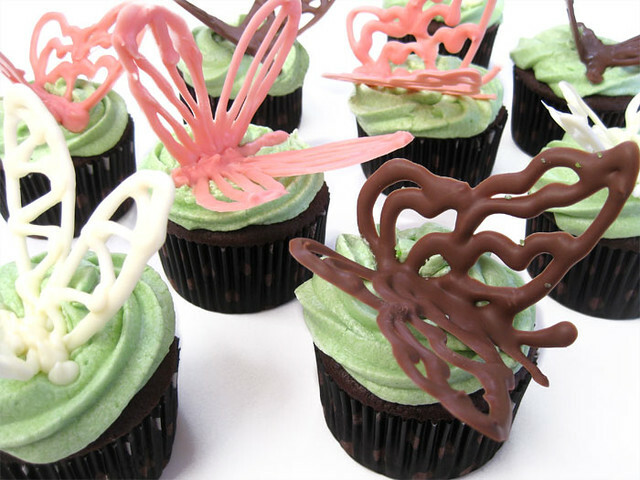 Gorgeous butterfly cupcakes and "so cute they almost aren't horrifying" dragonfly cupcakes. Re: Delicate chocolate butterfly cupcakes! Those are great! 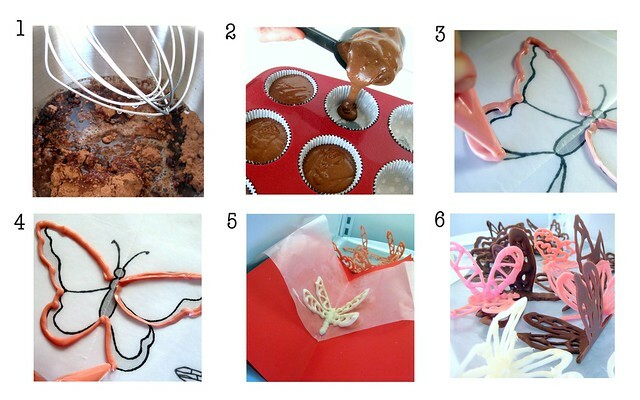 I'll be doing a butterfly cake on Friday with a few 3D chocolate butterflies. I hope mine turn out as well as yours!